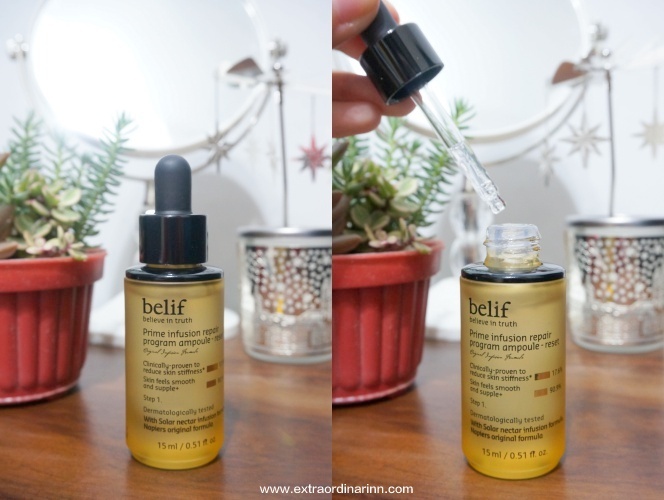 If you have read my previous post on the belif Moisture World set, you'll know that they are fast becoming one of my favourite skincare brands. I love how straightforward the ingredients are and they ACTUALLY WORK. belif combines time-tested apothecary herbal traditions with modern Korean skin science to provide the utmost efficacy for the skin. 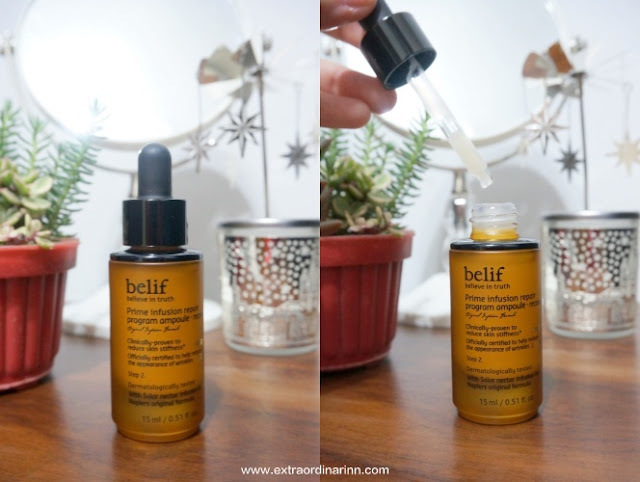 The belif Prime Infusion Range is one of the new releases at belif where it comes with a range of products too like toner, eye creams and essence. This belif Prime Infusion Repair Program Ampoule Special Set is a 6-week intensive care special program ampoule designed to deliver maximised anti-aging, hydrating, nourishing and skin retexturising through a series of steps based upon belif Prime Infusion Range's superior regenerative properties. During each phase, it is said that this 6-weeks program will put you on your way to more youthful, hydrated and smoother skin. The ampoules are formulated with what is known as 'the healing herb' - Mountain Daisy. It is a traditional English medicinal herb that is well-known for its purifying and regenerating properties, and is well-loved by THE British Royal Family (Is that why Queen E's skin is still so good at her age? Haha.) As with all their products, this range is formulated without parabens, sulphates and phthalates. If you think this set looks absolutely gorgeous, I have a disclaimer though. 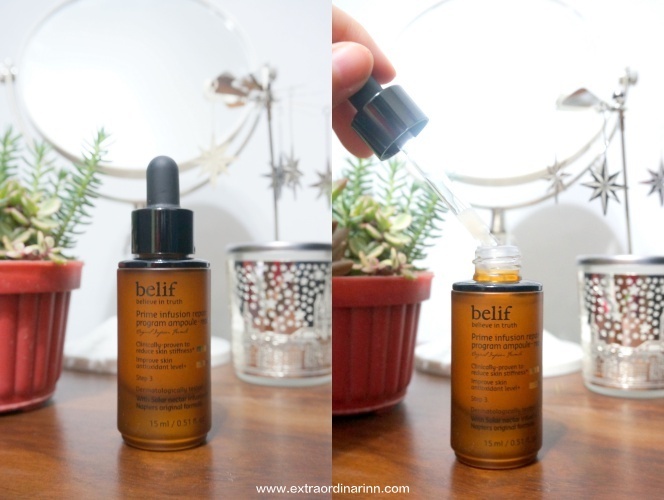 When you purchase this set at any of the belif stores in Klang Valley, you will receive the 3 ampoules but this special PR kit that we bloggers received has the travel sized version as well :p (don't be jelly hehe). Aren't these cute! For the full sized ampoules, they come in normal bottles and the droppers are placed separately in another box for hygiene purposes (I think). Don't worry, the set that you'll purchase is equally pretty with the vintage, natural-wood look! These ampoules are dermatologist tested and are free of mineral oil, petrolatum, synthetic preservatives, dyes, fragrances and animal-origin ingredients. This range is suitable for people who are looking for an anti-aging skincare range that can be delivered fundamentally to the innermost layers of the skin, those who are seeking fast improvements for sensitive and damaged skin as well as for those who seek a regenerative solution for the skin surface and also to recover, tighten and firm skin from the inner layers. Since this program lasts over 6 weeks and there are 3 steps, it means that each step should last you for about 2 weeks. Let's talk about the difference of each ampoule. Step 1 - REST is basically a soft, non-irritating ampoule that you use after applying your toner. As you can see, the liquid is clear and has a watery gellish texture. There is a faint herbal scent to it, but not too overwhelming. Marshmallow root is added as part of its main ingredient which consists of Mucilage to remove old dead skin cells that causes uneven skin texture to reveal silky, soft skin. This Step 2 - RECOVERY ampoule comes in a nutrient-rich texture that softly embraces the skin and penetrates deep within the skin layers to leave both a moisturising and firming effect. It is formulated with natural long-lasting moisturising and anti-inflammatory agents such as grape vine sap, which was extracted through the pruning process and contains active properties such as minerals, organic acid and flavonoid. The texture for this ampoule is slightly thicker but fret not, it is not sticky at all! PS: I shouldn't have a favourite since all 3 ampoules should be used together and not individually, but I do believe this is my favourite step as I can already see my skin improving at step 2! I believe the anti-inflammatory properties really do work as I can see my skin becoming more even-toned and less red at this point. If you've realised by now, the colour of the bottles seem to get darker while the texture of the ampoule gets more viscous. Step 3 - REACTIVATE is a highly concentrated, nutrient enriched ampoule (hence it's thicker, off-white creamy looking texture) which acts as a finishing touch to the intensive 6-weeks program. Even though it is thicker, this ampoule is still easily absorbed into the skin and can penetrate deeply into the skin to enhance skin firmness, add radiance and leave skin feeling smoother. The secret ingredient is lotus which helps to detoxify the skin with its strong antioxidant effect as well as make the skin stronger against external factors. Since this is an INTENSIVE program, you are advised to adhere to the instructions closely in order for the ampoule to work. 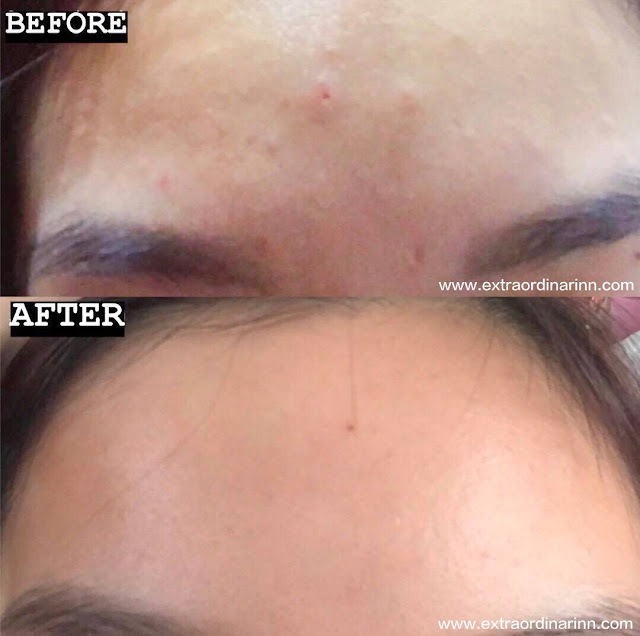 One round of this program should also last you for 1.5 months, and you can use the ampoules about twice a year (so maybe only do this every half a year?). The steps are the same for every bottle. Dispense 2 or 3 drops onto your palm and gently massage it over your entire face. You can reapply the formula one more time for areas of concerns such as dry spots or places that lack firmness on your face. Use the ampoule twice a day (once in the morning, once at night) and apply after toner. Now... are you ready for the results? *Drum rolls, please! * I swear, this is one of the rare times a skincare product actually worked SO WELL for me that you can actually see STARK differences in photos! I'm in love! Omg! Can you believe it? Actually, I posted this pic on my Instagram before and many of you were shocked as well. I've read that acne on the forehead is largely attributed to stress. When I'm stressed, I tend to pick at my pimples and dried skin as well (and also my lips, I think I have a skin picking disorder called excoriation). So, you can see what all the skin picking has done, it left holes in my forehead and severe redness and unevenness. So glad that I now have a solution for emergency uses! - Highly specified ampoules at each step that targets a specific problem to fix the skin slowly, but surely. They don't promise a one-size-fits-all solution like some products tend to do. Instead, you yourself have to be disciplined and follow the intensive program closely to see promised results. - Just look at the results. Need I say more? - I wish they sold this set online or best if belif can open more stores in Malaysia, so I can easily get my hands on them in JB too! Where to buy: Belif Stores (list of locations here). Also, some products are available on Hermo, Althea & Zalora.